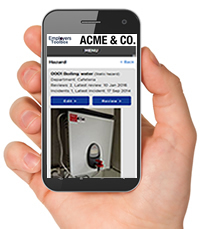 The Employers Toolbox Mobile web application has been updated. The largest area of change in the update lies within the addition of Health & Safety to the Mobile version. For subscribers to Health & Safety online the Mobile Toolbox will automatically have the Health & Safety as a menu item at the top. For the large part, Health & Safety Mobile follows the functionality of the other modules in as far as it offers download and reference capability with cut-down functionality as compared to the full Employers Toolbox online website. The Health & Safety mobile web app offers the user the ability to report and register incidents & accidents and the ability to register and review hazards directly from your mobile phone or smart device in the field. Being smart device ready means the usual functionality from mobile devices such as inbuilt camera and automatic picture uploading come as standard. Remember you can have logins for your staff which only have access to Health & Safety (or other modules in isolation).